FOR IMMEDIATE RELEASE: Second Pets™ New Species Japanese Snapper! 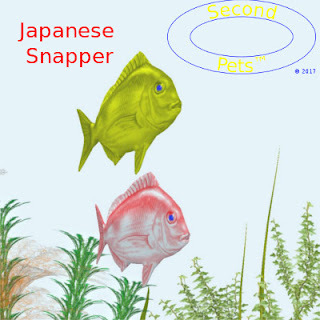 Japanese Snapper are here! They are available at our in-world store http://maps.secondlife.com/secondlife/Chopsaw/28/162/25 and on the Marketplace https://marketplace.secondlife.com/stores/195307 . Second Pets™ other two fish species, Clownfish, and Koi are also avaialbe in-world store http://maps.secondlife.com/secondlife/Chopsaw/28/162/25 and on the Marketplace https://marketplace.secondlife.com/stores/195307 . Follow us on Facebook https://www.facebook.com/Second-Pets-231774600708382/ . Remeber Second Pets™ Fishes are satisfaction guaranteed https://www.secondpets.com/FAQ.html#guarantee . Contact secondpets@secondpets.com or send a NoteCard to SecondPets Resident if you have questions or problems.